Neil Young's hi-res audio service will lead to "ridicule and failure" | What Hi-Fi? Neil Young's hi-res audio service will lead to "ridicule and failure"
An industry expert has slammed Neil Young’s attempt to create a high-resolution music service. Linn Products managing director Gilad Tiefenbrun has dismissed the Pono project as "misguided" in a blog on Linn’s website. "There are already music players that play high resolution digital files. In FLAC we have a perfectly good file format that is free, open and lossless. "Pono risks fragmenting the market, confusing many of those music lovers who would choose high quality, and delaying the standardisation and adoption of high resolution by the wider music industry." Linn has been at the forefront of streaming audio in the hi-fi world, ditching production of CD players back in 2010 and enthusiastically pushing its range of streaming products. So of course the company has interests to protect. 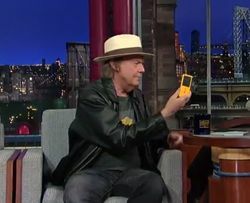 Young hasn’t said much about the Pono hi-res audio project since unveiling a prototype device on The Letterman Show. But in his new book, Waging Heavy Peace, he reaffirms his belief that his project will "save the sound of music". He also reveals that Pono, meaning "righteous" in Hawaiian, was originally called Puretone. The download service is expected next year, along with a range of players. No fixed date or price just yet, but we’ll be keeping an eye on Neil Young and Pono next year.